Getting kids to go from "Oh, yuck!" to "Oh, wow!" Much of our time at the Sibley Nature Center is spent identifying local critters and plants for our visitors and callers. It is good having a name for the living creatures that share our immediate surroundings. Calling a plant a weed or an insect "those darn bugs," leads to a bullying attitude. "Kill them all," becomes a person's creed. Such ignorance and fear breeds indifference and even hate toward the natural world. When one learns the name of something, an enrichment of the soul is begun. No longer is the natural world one-dimensional, the person seeing only danger or feeling only revulsion. The more that is learned about the world around us, the more our minds are exercised. Learning is play. The bluebottle fly or bottlebee (Calliphora vomitoria) is a common blow fly found in most areas of the world and is the type species for the genus Calliphora. Similar species include the greenbottle fly, a close relative that can be distinguished by its bright green metallic colouring. 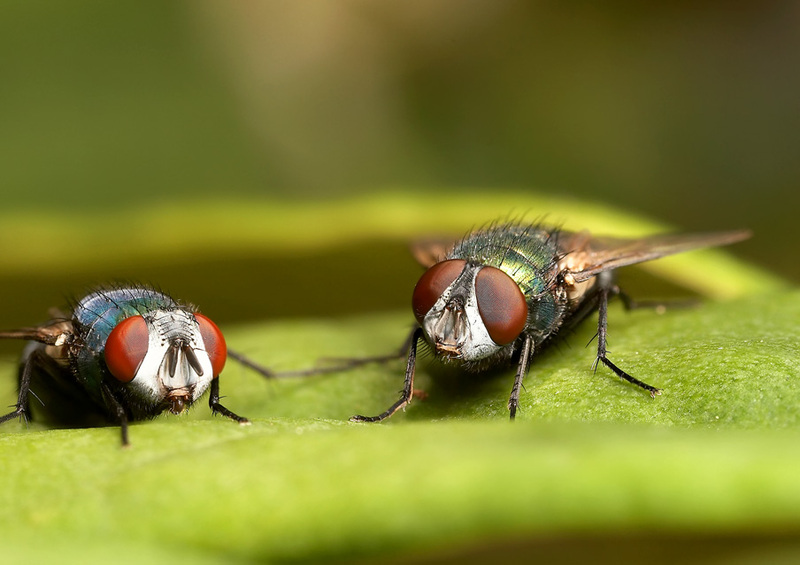 Bluebottle fly adults feed on nectar, while the larvae feed on carcasses of dead animals. Adults are also pollinators to some flowers with strong odor. Most species of scorpion have been studied, and many facets of their life history is known. Grant and corporate funding is available to research creatures that either hurt people or affect them economically. The millions of species of invertebrates that are benign are rarely studied, except by taxonomists (who merely name the creature), or by amateurs (who do it for the satisfaction of curiosity and out of fascination of the creature). Amateur naturalists have studied the birds of the Llano Estacado for over fifty years. Local wild plants have been studied over forty years. Amphibians and reptiles have been recorded by local enthusiasts for over thirty years. Invertebrates, however, have had little attention paid to them by regional amateur naturalists. Butterflies were the breakthrough group of insects for investigation on the southern Llano Estacado. Local observers have identified over one hundred and twenty species. Most of the species have been photographed, as have the egg, caterpillar, and chrysalis of some species. Very little is known about most species of local invertebrates. No one has kept exhaustive records on anything except butterflies (and insects that damage cotton). At Sibley, we haphazardly attempt to further the local knowledge. We started an insect collection. When with a tour group we often capture something and watch it for a day or two, and then release it. With the best of intentions, observation lists are recorded on many walks, but our record keeping has been lax and unorganized. One year, a group of older summer camp kids elected to study dragonflies. How does one catch a dragonfly? It is almost impossible to catch one with a butterfly net. Next the kids tried water guns, but the dragonflies easily dodged. Rubber band guns were ineffective as well. The kids finally caught a few, but were frustrated that the only identification book available at the time had only a few black and white photographs accompanying a very technical text. In honor of their endeavors, I later located a few color photographs of the dragonfly species that might be found on the Llano. A few more pictures were obtained from the Internet, where I found two national dragonfly society webpages. Eventually, I built up a "possible" species list. The information we gathered was collated into two three-ring resource binders. In 2003 a Dragonfly identification book was published, so we bought a copy. Two local enthusiasts developed a preliminary checklist of species observed the same year. One of the exercises the summer camp students performed seemed boring at first. At the pond we assigned each student one dragonfly to watch, mapping all its activities. Dragonflies often sit for long periods on a favorite perching post, the only movement an occasional twist of the head, (a remarkable feat few insects perform). When another dragonfly of the same species flew into the territory of the perched one however, a fierce chase ensued. If the intruder was younger and stronger, the dragonflies collided, clashing wings. Dragonflies have superb eyesight, detecting motion up to a hundred yards away. The males of larger species defend a territory as large as thirty feet across. Smaller species may have territories only a foot or two across. The kids noticed that interspecific aggression sometimes occurs, and sometimes not. To understand such vagaries of behavior would entail more observation than a group of kids can do in five mornings. As the kids hiked to the pond, they noticed several dragonflies a long distance from the water. They theorized that it was necessary for the dragonflies to roam about in search of food (wondering if too many dragonflies had eaten all the prey at the pond). Upon returning to the classroom the old identification book was consulted, revealing that newly metamorphosed dragonflies leave the natal pond to aimlessly roam the countryside. The wanderer (known as a teneral) may find another pond with a different population of dragonflies of the same species, ensuring a gene flow from population to population as a result of mating. Have you ever watched dragonflies in your yard? Do you have a small water feature in your landscape? Even the smallest pool, half hidden in green drapery, adds a whole new world to the ambience of your life. A goldfish or gambusia and a leopard frog, or birds coming for a drink or a bath … the eye is often focused to lead you to peaceful repose and contemplation. As you get to know your non-human neighbors, you may be startled and amazed. Who knows what you fun as you play with dragonflies! Dragonflies are symbols for many people. Some see their jewel-like sparkle, and feel blessed by their presence. For some dragonflies symbolize thoughts, flitting about in flights of fancy, darting quickly. For others the dragonfly's strange eyes spur the imagination in a different manner - have you ever heard a dragonfly called "the devil's darning needle?" Some folks collect dragonfly art and models, and wear dragonfly t-shirts, to express their love of such amazing creatures. Do you have a story about dragonflies? or birds coming for a drink or a bath … the eye is often focused to lead you to peaceful repose and contemplation. As you get to know your non-human neighbors, you may be startled and amazed. Who knows what you fun as you play with dragonflies! Think of the first emotion that is felt when a person first sees a scorpion - utter stomach-turning distaste. "OOOOh yuck! NASTY!" But, in learning more about scorpions, one discovers marvelous and wondrous things that fill the heart and soul. "WOW!" becomes the emotion. "Look at these scorpions … what are they doing? … oh, my gosh!, they are dancing, holding pincers and bootscooting back and forth - oh WOW!" Scorpions dance and kiss. Their primary sense is touch, for they "hear" with their feet, responding to tiny vibrations on the soil surface. They are very maternal, for the female carries the just-born young on her back for a week or so. Their exoskeletons are covered with several wax layers, making them almost watertight, and able to withstand higher body temperatures than nearly any other desert invertebrate. Scorpions can withstand severe dehydration, remaining alive after losing forty percent of their body weight. 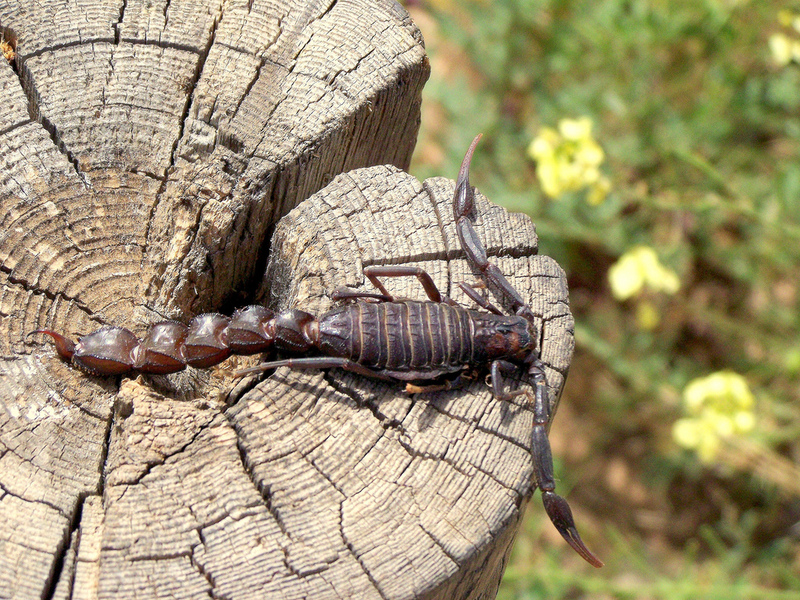 The three species of scorpion on the southern Llano Estacado are not dangerous, except to the few people who might have developed severe allergies to their toxins. Normally, a scorpion sting will burn for thirty minutes and then dissipate. Multiple stings sometimes bring a mild fever and a tightness to the skin for a day or two. Knowing such "personal" facts about scorpions does not lead to satisfaction in clubbing one to mush. Instead, one is moved to carefully catch an uninvited scorpion in a paper cup and take it to a vacant lot to live free and wild. Other people may consider such an attitude silly or misguided, but … so what!